It’s July 31st. I hear Carole King singing in my head and dream of waking up beside the man I love on the first day of August. Hers is a love song to summer. It’s not yet noon, over 100 degrees, muggy. Clouds piled against the mountains move toward us. One good thing: this weather gives us cleaner air. Second good thing: cicadas loud in the two trees. They change pitch, volume, breath, weave sound in and out, insect orchestra. I have just read the chapter of Natalie’s book where she talks about teachers, about Wendy. She is right. Wendy’s rich prose makes me envious. But right before, she tells us to copy Hemingway, to write a piece in one or two syllable words. I think: I do that. I don’t need to practice that. It’s organic, what comes to me. Today is the eve of the halfway point between midsummer and the fall equinox, the veil between the worlds thin. I make a small altar on the courtyard table: two tomatoes grown in the big terra cotta pot, bougainvillea, tecoma and Mexican birds of paradise from our garden, orange calcite, yellow citrine. I light one candle for this harvest time, for this turning of our world, and a second candle for all the beings I know who’ve died in recent months, feline, human, canine: Sunny, Auntie Christel’s brother in Germany, Bob, Colleen’s father, Annie. I ask for blessings on their spirits, on the ones left behind, still in bodies. May we honor both sides of this thinning veil. I take a deep breath, hear small chirpings in our tree. A verdin, I think. One lone dove sits on the wooden fence, Boo sprawled beneath the apricot mallow. Sofia comes outside, drinks water. Everything goes still. And then the cicadas begin to buzz again, and I draw another breath, keep my pen moving across the page. Sweat rolls down my right temple. My stomach growls. I twitch a fly off my forearm. I am in love with the last day of July. I sit in the courtyard watching a raven in the rain. He is sitting in a palm tree in the distance, moving up and down in the light wind, but he seems to be enjoying himself. I count the seconds between the lightening and the thunder. Sable goes inside, hides under the bed, the only marring of my delight. In the kitchen I hear a loud popping sound and look out the window half expecting to see a palm tree in flames. Outside again, the birds take flight in unison, and I crane my neck looking for a hawk. He lands in my neighbor’s tree, and I move the binoculars to my eyes in slow motion. He’s all wet, his neck feathers slick and clumping like the wet fur of a cat. He is gorgeous, regal, his golden eyes fiercely alive. Later, I eat popcorn in bed, my eyes closing on my book, and let sleep claim me. I drift from dozing to deep sleep and back again, the steady rain soaking through all my layers. It is this long nap in the rain on a summer afternoon, so rare here, that is most alive in me now as I write, embedded in my flesh, touched by the divine. Did I remember to thank you? After, I go for a walk in the late dusk. I place each foot with care, small frogs hopping out of my way with every step I take. Today I take Amtrak to Oceanside. According to some schematic of the Peaceful Warrior, this year for me is about adventure. (Last year was stability.) Unwilling as I am to leave the cats for long, I am determined to embrace the small adventures, day trips across town, across the state, over the border. When this one is complete (I am about an hour and a half away from Palm Springs as I type this), it will have been a 12-plus hour trip for two and a half hours in Oceanside, but it is worth it. I spend travel time writing and working on my blog, my breath caught short when I first see the ocean through the train window. I talk for a long time to a man with a Catalan accent who lives blocks from me. 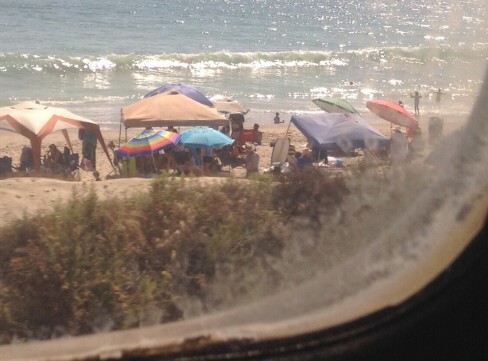 In Oceanside the tide is in, so I can only walk for a short stretch on the beach, but I relish it, the untamed rush of water that splashes my thighs, the frolic of my fellow beachgoers, bright umbrellas clustered everywhere. I love every minute of walking through the town. The air is clean. I study each street as I walk, dream about living in the old apartment building with the tangled bottlebrush lining the sidewalk, windows thrown open to the sea only a short block away. I am not here long enough to get a sense of the community, but nothing rubs me wrong. Already it feels like a new friend, that first blush. I look forward to more visits, to the getting-to-know-you process, to finding the warts, discovering the underbelly. Back in Riverside County in the middle dusk, the fresh sea air and the shimmer of sun on water seem like a dream, like a thousand miles ago. But it’s a good dream, the kind of dream you want to wake up from slowly, the kind you want to savor, wet sand beneath your bare feet, the warm air salty on your tongue. I wake from deep sleep after 8am. Good dreams drift away like fog before I can wrap my hands around them. I look out the window, and joy rises in me, full and light. It is the eleventh day of my 16-day holiday. I stand beside the kitchen sink and know I have fully returned to myself. Have I been gone for weeks? Years? It took ten days to shed the angst of having to check in throughout the day to answer questions. Even during the times of year when I take weekends off, it is not long enough for me to stop “feeling” people out there needing me, students and educators both. Now on Day Eleven I am free of it. I can feel the difference as the day unfolds. I am not in a hurry. I feed the birds, haul buckets of collected water from the sink and tub out to the young bougainvillea. I make my “liver flush” drink, lemon and garlic and olive oil in the blender, brew my fenugreek tea, feed the cats al fresco. I sip my drinks in the courtyard, talk on the phone for a long time to dear old friends who summer in San Francisco. I slide in yoga, too, quiet and easy, before I need to leave. I stay mindful, don’t rush, eat yellow melon and Brazil nuts from my purple glass bowl. When Audrey drives up, I bring my breakfast with me and eat it in the car. When she brings me home again after we have run around in the hot, humid afternoon, I eat gazpacho and slices of tofu on the patio and let myself read my Valdemar novel while the sun lowers in the sky. I water and feed the birds again in the almost dark because I am leaving early in the morning. A huge frog hops across the pavement, and I hope he is the same one I met before, am cheered to think he may have survived since spring. Later, I even take the time to make garlic and beet goat yogurt dip, and after my shower I eat it with potato chips and watch Parenthood until midnight. I can’t say how good it feels, how grateful I am to have come to this point. The difference is subtle, wordless, impossible to define. But today I have more room inside my skin, and being present becomes effortless. Why, I wonder, would I ever want to be anywhere else? I don’t go to yoga this morning. Instead, after I water the front I weed the bed with the tecoma bush. The Mexican bird of paradise there has taken off. It’s taller than I am. When I begin weeding, I know I’m not going to yoga. I want the luxury of being able to putter, to not rush through my morning chores to hurry across town. I do the rest of the watering, and then I end up clearing away all the things that have collected on the floor, the ice chest and remains of our picnic a week ago, the cans of tuna and cat food from Trader Joe’s. I wash the bamboo plates and spoons. (Yes, I am terrible. They have sat there for a week wrapped up in flowered cloth napkins, crusts of hummus on them.) 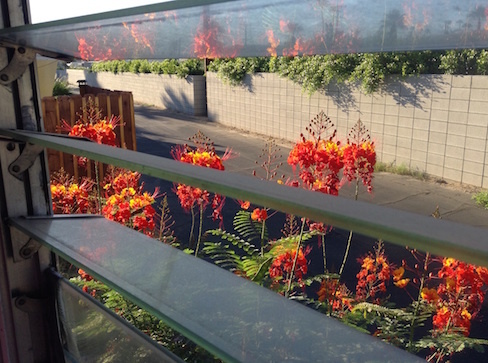 I take a photograph of the birds of paradise through the open louvered windows with the morning sun falling on them. I talk to my friend Meri on the phone for a long time. In the early afternoon, I reread three chapters of Natalie Goldberg’s latest book about writing. I eat Brazil nuts and a big bowl of cherries. The mourning doves are eating fallen seeds. Sable is still outside with me, so every now and then I wiggle my foot or wave a pillow at them to get them off the ground. “There’s a cat,” I say. I point to Boo snoozing in the shade under the honeysuckle. The birds watch me, expressionless. (Who is this crazy person? What is she saying?) The flies annoy me, insisting on touching my face, my calves, landing on my ears. I want them to go away. Cicadas buzz from my neighbor’s tree. They are one thing I love about summer in Palm Springs. I have a goal now to make a list of more things I love so I’ll remember not to hate summers here. After I write I’m toying with the idea of excavating the tabletop, maybe finishing assembling the shelves so I can remove the tall stack of books from the kitchen chair. I have not yet figured out how to live in 340 square feet. Maybe, I think, I will even wash the floor today. Or maybe I will make scrambled eggs and turn the misters on and sit here reading my latest novel about Valdemar. It’s easy to call the odds for this one as soon as the idea surfaces. But you never know. It’s Day Three of my holiday. Anything can happen. It’s crazy hot. I’m dripping with sweat but reluctant to go inside. 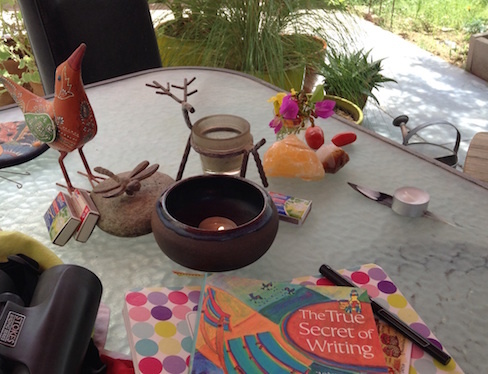 I’ve become attached to reading Natalie Goldberg and doing my “morning writing” on the patio, even on days when morning becomes late afternoon. Today she talks about being lonely, how Katagiri Roshi says we must stand up in it, not let ourselves be “tossed away.” I think of Bernardo. I saw him on the creek path last week. He told me how lonely he is, how women won’t engage with him because he is not wealthy, because he is short. I talked about how we often don’t get things we are too attached to wanting. It’s the way the universe works. I used my writing contests as an example, how I may be too attached to wanting to win. But my heart went out to him. Today my horoscope says that empathy is underrated but much needed, great for actors, parents. Teachers? Writers, too. But it isn’t always an easy gift. Empathy hurts. I know deep loneliness. Maybe without knowing I learned to stand up in it. I made my peace with it. Bernardo hasn’t, I don’t think. He’s hoping someone will come along to make it go away. It’s why I’ve always felt uncomfortable in our exchanges even though I like him and enjoy our talks. I sensed this, a kind of energetic grasping. Of course, there’s a hunger for connection, for physical closeness, too. It’s different from loneliness but a close cousin, all fruit of feeling alone in the world. Feeling connected to the planet helps. I miss walking every day for that, for the big picture connection. But even here in the courtyard I have my mountains, our palo verde, the birds, the moon, the wind that picks up now as I write, wanting to be included on my list. I feel lonely, yes, but not like years ago. Bernardo’s is a deep ache. I ache for him, for all of us, stumbling along being in bodies, saddled with the illusion we are all alone and separate, our odd human condition. We fumble, tumble into each other, mudballs all—stars inside us.